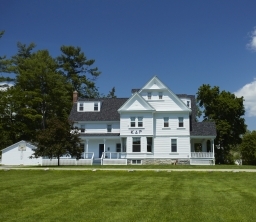 KDR house at 48 South Street in Middlebury. MIDDLEBURY, Vt. -- Middlebury College has terminated the Kappa Delta Rho (KDR) coeducational social house following an investigation that uncovered multiple violations of the College’s hazing and general conduct policies. Vice President for Student Affairs and Dean of the College Katy Smith Abbott informed the leadership and members of house of the decision in a letter on June 25. Middlebury had suspended the house on March 24 following an initial investigation and determination that KDR members had violated the College’s hazing policy in November 2014. The violations reported then included verbal abuse and blindfolding of new members, and encouraging the use of alcohol. As part of the suspension, residential members were required to vacate the house and were reassigned to other on-campus housing. In April, subsequent to the suspension, new evidence came to light that triggered a second formal investigation. After reviewing the results of that investigation, and consulting with the College’s Community Council organization, Smith Abbott recommended—and Middlebury President Ronald Liebowitz concurred—that KDR be terminated. The second investigation uncovered new evidence showing that house members had engaged in a pattern of behavior that violated the College’s Hazing Policy on multiple occasions going back to 2013. It also established that members had engaged in an orchestrated and coercive effort to mislead Public Safety officers and College-appointed investigators and to obstruct their work. Those actions were a clear violation of Middlebury College Student Life policies governing Respect for the Authority of Officials (Section 5) and Communicating with Honesty and Integrity (Section 6). Information about Middlebury’s general conduct and hazing policies is available online. The KDR house at 48 South Street, which is owned by the College, will be used for general student housing starting in the fall of 2015. With its termination, Kappa Delta Rho will no longer be a recognized student organization, and no events, gatherings or functions related to the organization, formal or informal, may take place on or off campus. The termination of KDR brings to an end a long history for the organization at Middlebury College. Kappa Delta Rho was founded as a fraternity at Middlebury in 1905 in Painter Hall. A historical plaque on the building commemorates the event. In 1990, when Middlebury required that all fraternities become coeducational, KDR was the only one of more than a dozen on campus at the time to do so, though it lost the official recognition of the national organization for nearly a decade. In 2000, the national organization again recognized the Middlebury KDR social house as its “alpha” chapter, albeit as the sole chapter of the Kappa Delta Rho Society (as opposed to fraternity).